InsideIIM.com as a part of its social sensitivity initiatives is helping Acumen reach out to bright talent in India. We strongly recommend applying to this program to any professional with a mindset to change the world for the better (specifically targeting poverty alleviation) and who have a demonstrated record in leadership for social initiatives. 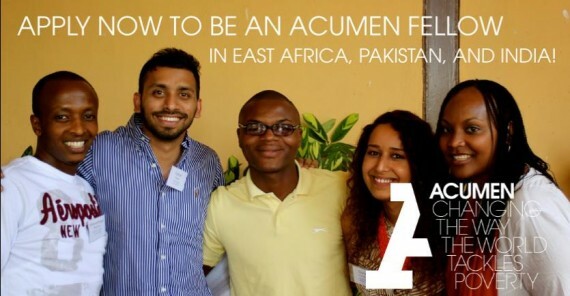 What is the Acumen India Fellows program? The India Fellows Program is a one-year leadership development program for up to 20 emerging leaders dedicated to addressing India’s most pressing social problems. Fellows can be working in any sector (non-profit, for-profit, government), on any issue, and can be either entrepreneurs or intrapreneurs. The year-long program is structured like an “executive MBA” where Fellows remain in their jobs and meet for several week-long seminars over the course of the fellowship year. Over 90% of India’s 1.3 billion people live on less than four dollars a day, and yet while so many live in extreme poverty, the country’s elite continue to accumulate wealth by the billions. The next phase of development in India must take a drastically different direction guided by a new generation of Indian leaders who are willing to challenge broken systems, possess an unwavering moral compass, and can see opportunity where others see only challenges. Acumen’s India Fellows Program is providing an opportunity for emerging leaders to receive world-class leadership training and collaborate with like-minded peers so that they can be the change that India needs. 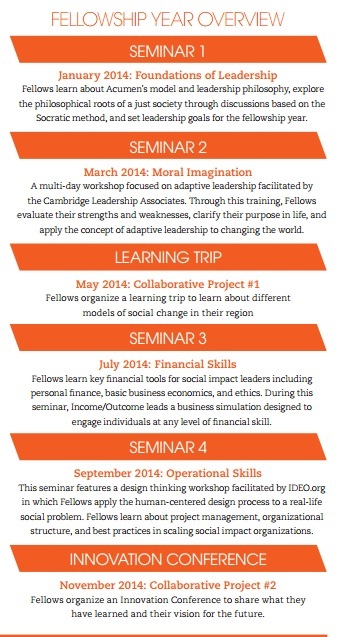 Throughout the fellowship year, Fellows participate in world-class trainings led by organizations such as IDEO.org and Cambridge Leadership Associates. Fellows gain access to Acumen’s extensive community of advisors, peer organizations, and join an extraordinary cohort of fellow leaders, working across sectors. On graduation, all Fellows become part of a global Alumni network that they can leverage for support and collaboration. For any questions on this program, please leave a query in the forum below. Medha Dixit, Associate with Acumen will personally answer any questions that you may have! The India Fellows Program is a program run by AF Trust, and also receives support from Dr Reddy’s Foundation. Acumen’s mission is to change the way the world tackles poverty by investing in companies, leaders, and ideas. We raise charitable donations to invest patient capital in business models that deliver critical goods and services to the world’s poor, improving the lives of millions. Since 2001, Acumen has invested more than $82 million in 73 companies around the world. 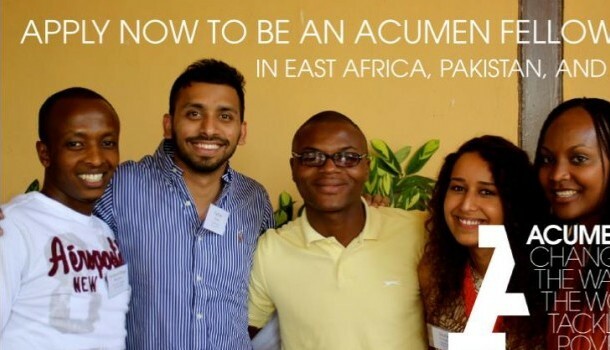 Acumen also works to build a global community of emerging leaders that believe in creating a more inclusive world through financial and operational expertise combined with moral imagination. Acumen is committed to learning at the edge, sharing ideas, insights, and lessons learned. Have you taken our Recruitment Survey yet?